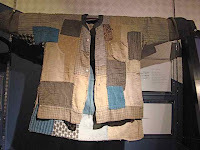 This is the second post about the exhibition of Boro textiles at Amuse Gallery, Asakusa, Tokyo. 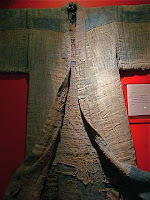 The pieces that amazed me were the huge kimono which were about 6-7ft tall when they were hung but were made for a person to sleep inside during winter, the padding is about 2-3 cm thick and they are made of layers of fabric and what looked like cotton stuffing. 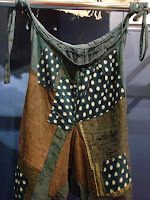 many of the layers were shredded down to just the area around previous stitching. thanks so much for your message. i managed to source the Boro book through Gallery Tsumagi, whose very helpful owner mailed me the book within 5 days of my ordering it. now to gaze happily at your pictures! hello, I emailed Gallery Tsumagi as well but they are sold out-- I hope to get the book some day as well... your pictures from the exhibit are wonderful.